Those with any familiarity with the online film music community have most likely heard the name of Mikael Carlsson, webmaster of one of the internet's best film music websites, musicfromthemovies.com. 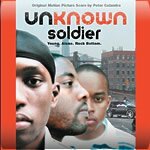 Carlsson and his new label, Movie Score Media, recently its debut soundtrack release for the 2004 indie film, UNKNOWN SOLDIER. While composer Peter Calandra's jazz-centric score may not be what the typical score fan might be looking for, UNKNOWN SOLDIER certainly has appeal for that "otherside" of some of our musical palettes. Calandra has spent much of his career in the realm of broadway musicals including involvement with projects such as Miss Saigon (piano), Les Miserables, Phantom of the Opera and Little Shop of Horrors (piano, conductor, musical director). His film scores also include JELLYSMOKE and 13th CHILD: THE LEGEND OF THE JERSEY DEVIL. The music for UNKNOWN SOLDIER is performed by a small jazz band predominantly featuring bass, drums, occasional synth and string accompaniment, but truly finds its voice in the piano and saxophone leads. The intimate nature of this film, set in Harlem, is matched well by Calandra's warm and introspective tone. A nice departure from the abrasive hip-hop tracks that, many times, accompany stories set in such places. The release of UNKNOWN SOLDIER is a welcome one. Thanks to those committed to film music like Mikael Carlsson and technological innovations like iTunes, fans of the genre are sure to get legal access to the music they most appreciate.